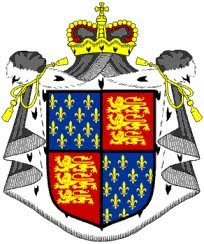 I had posted last February (specifically, February 9, 2009, if you want to go look it up) about the fact that, despite my strong interest in heraldry, I’d been unable to find anyone in my family tree who had used a coat of arms. That post had noted that, by golly, maybe I’d finally found one. Now, I’m really not trying to say that this is really great shakes. 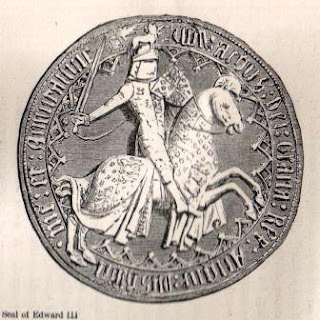 A genealogical article from a couple of years ago estimated that about 80% of people of British ancestry have Edward III somewhere in their family tree. (And over here we call George Washington is the “Father of his Country”!) No, the cool thing to me is, once again, finding someone else in the family tree who used a coat of arms. And in this case, there’s a whole bunch of relatives who used armory. Because, of course, once you’ve linked into a royal family (from any country), both their ancestors and their descendants (for at least a few generations, if they’re outside the “main line” of eldest son to eldest son) tend to be pretty well documented. So I’m happy to be able to add Quarterly France and England to the small, but finally growing, list of coats of arms used by members of my family.